Agri-Supply UK offers a wide range of agricultural and country related products including electric fencing, workshop tools, tractor parts and animal husbandry. We stock brands such as Rutland Electric Fencing, Case IH, Massey Ferguson, Wile, Horizont, Wahl, AKO, Hella, CTEK, Mr. Funnel, MacNaught, OKO, Neosorexa, Britax, Gripple and of course our own brand of Agri-Supply products. We currently specialise in electric fencing products including electric fence energisers, insulators, fence posts, fence tape and poultry netting. There is free shipping for any orders to the UK mainland over £150 in value. 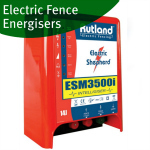 Agri-Supply UK offers several brands of electric fence energisers so you will be able to find an energiser to suit your system. All Mains, 12v battery, dry battery and dual power fence energisers come with at least a two year guarantee to be sure your getting quality at a great price. The most important choice for your system is choosing your electric fence energiser as you will need to decide on the power source and also the size of fence energiser you need. We carry a large stocks of a selection of electric fence posts our most popular being the 3ft, 4ft and 5ft poly stakes. Dependent on the animal you are fencing we will have the electric fence posts you need. The 3ft height fence posts are generally used in pig, sheep and pony fencing. The larger 4ft and 5ft are used in electric fences for horses. We also offer a great selection of fence conductors such as poly tape in 12mm, 20mm and 40mm width in both white and green. There is also different qualities available such as economy and premium electric fence poly tape. Electric fence tape is generally used in electric fences for horses due to its high visibility, safe design and ease of putting up and taking down. There is several different types of electric fence wire in store with stranded wire wire which is most used for fencing pigs, sheep and cattle. Poly fence wire or twine is also used this purpose offering a high visibility option. Electric fence rope generally is 6mm diameter and is primarily used in horse fences where windy conditions are present. 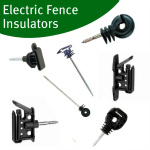 Once you have your choice of fence conductor set it becomes easier to get the correct insulators. Electric fence insulators come in a large array of designs suitable for different fence lines and situations. The most commonly used is screw in ring insulators that are used paired with fence wire or 12mm poly fence tape. There are specially designed 40mm tape insulators which are used mainly in horse fences. We have a great range of electric fencing for chickens and other poultry items. Poultry netting is generally as the best way of fencing chicken and keeping foxes out. Poultry netting is available in 25m and 50m rolls and in the colour of green and orange. There are poultry netting kits available which will give you what you need to setup the fence. To complement this we have poultry feeder and drinkers in various sizes and designs and also egg incubators. Agri-Supply UK are an official stockist for Hunter Boots including their legendary wellington boots and newer products such as hunter welly socks, boot bag, jackets, kids wellies and much more. We have the latest styles available including the opportunity to pre-order products that are not even out yet. We are now stock horse poly show jumps including blocks, poles and mounting posts all UK made. There are a variety of colours available and poly jump kits can be purchased to give you a saving.